So much for updating on the go? In case you were wondering I arrived safe and sound back in Seoul last week after a glorious two weeks spent backpacking through Turkey. Amid all the sights and activities, I did do a lot of eating which is giving me motivation for my jogging once more (is it too late to be on track for the ripped physique for summer?). Now, I did say I would try and update on the go while I was there but that clearly didn't happen which I attribute to a combination of lack of internet/slow internet (people actually still use 3G? :P), laziness and all in all pooped out-ness. Before I left for Turkey I must confess my knowledge of Turkish cuisine was limited to kebabs and whatnot which, I wasn't even sure if it was authentic Turkish since I'd had similar things in Greece. Along with learning firsthand on just how enormous the country is, I learned that it is quite a bountiful and blessed country in terms of food. Not only is it by the sea (fresh seafood!) but it has plenty of space to grow its own produce while having a cuisine that has influences (and the spices) from its Asian, European and Middle Eastern neighbors and long and illustrious history. The result is food that is just fresh, fresh and fresh. No need having to import produce, plucked before they are even at their peak, from other countries or fish that have long breathed its last breath. Two weeks is too short a time to have really gotten to know the cuisine and I know I only just scratched the surface but here's a smattering of some of the delicious fare I gorged myself upon. Dinner was a choice between a chicken kebab or bibimbap but c'mon, if I'm heading to Turkey, might as well get my meals on Turkish style right? I have to say the dishes were all rather on the salty side. The little side dishes were good but I still can't seem to get over why many would choose to cook perfectly good rice in butter. The wine was pretty good and I would have ordered another bottle for myself but seeing how difficult it was to even get a glass of water from the stewardesses during the meal, I decided to forget it. The omelette breakfast served a few hours later was, again, rather salty with the mushrooms accompanying it having soaked up a good portion of the salt. 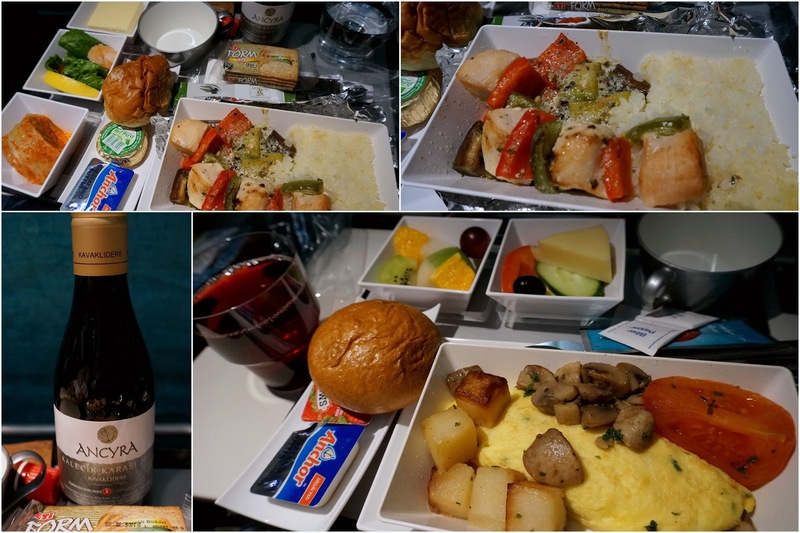 Overall, food on Turkish Airlines was OK, nothing too spectacular but if I fly with them again I may opt for a low-sodium meal next time. Anyways, after 12 hours of flying, I finally landed and arrived at a (wonderful) friend's place where I would stay for a few initial days in Istanbul. Despite my first day being a weekday, my lovely friend and her awesome boyfriend took much of the day's time to me as they took me around. Now, with Sultanahmet being such a touristy area with three of Istanbul's biggest sights (Topkapi Palace, Aya Sofia, the Blue Mosque) the area is infamous for serving up bad, touristy food at hiked up prices but the smattering of Kofte shops near Sultanahmet station (just a hundred meters or so from the Aya Sofia) are probably your best bets for a quick and authentic lunch. And you know it's the real deal when you walk in and you see nary a tourist but only locals filled up in the place! Kofte are meatballs made of ground meat that have been mashed with spices and cooked on a stick. The kofte and the lentil soups are the big specialties here and were especially wonderful for chillier days. The lentil soup is every so slightly thicker than just soup but goes down wonderfully in your belly. A wedge of lemon is served on the side to squeeze into the soup and I can't explain how but it simply magnifies the flavor. A sprinkling of herbs and/or roasted red pepper powder that are on each table are optional but I think a good complementing addition. The Kofte and chicken skewers come freshly grilled and though the chicken is delicious enough, it's really the Kofte you should be paying attention to. They have the look and texture of breakfast sausages but are less subtle in flavor compared to their American counterparts I was used to. The mix of herbs and spices within are subtle, without overpowering the meat. Soon after the meat dishes are served a waiter will come around to ask if you want some of their sauce which is like a roasted pepper sauce. It's not very spicy nor is it very strong but man, is it good with the meat. Take a bite of the sausage with the sauce, take in a spoonful of the rice and take bites off the pepperoncini in between... delish! Ayran is a unique drink worth mentioning. It's a popular yogurt drink that's as common as milk there and believed by the locals to be good for an upset stomach (I'm guessing there's an assumption that the drinker is not lactose intolerant heh). Even for the biggest lovers of yogurt, however, Ayran will probably be a polarizing drink as the drink tastes like yogurt... but with a heavy dosage of salt. No, the taste is not like unflavored yogurt but like a runny, salty yogurt drink. I have to say even myself, a big fan of unflavored yogurt, found the taste a bit shocking at first. But I agree with my Turk friends- it's not so bad once you get used to it and I even found myself buying one at times when I was feeling a bit peckish while walking around. I was already stuffed at the end of the meal, but Murat, Simona's boyfriend, insisted I had to try the Irmik Helvasi (or "sweets" as they are called). I'm not usually a big desserts guy but this was a dish I really enjoyed. Made of semolina (also known to us Americans as grits), the ground grain is combined with pine nuts and simmered in a syrup of milk (or water), sugar and margarine. The result is a slightly sweet but grainy and nutty dish that I found quite delightful. I have to say I was also quite surprised during my trip to learn how much the Turks love their bread. At almost every meal a basket full of various breads and rolls will be served and you can look around to see all sorts of the locals dipping their bread in soup, spreading various spreads on them or taking big bites of them in between their main dishes. And with the copious amounts of rice, pitas and other carbs, it can either be heaven or hell for an individual depending on where they stand on their feelings for carbs but I've always been a carb lover so I wasn't complaining! Now the whole fresh produce thing I was talking about earlier also shows itself on the streets in delicious ways. Pomegranates, I read, originated from nearby Iran and they were certainly a common sight in Turkey and also common to see pomegranate stands in busy areas selling freshly squeezed pomegranate juice. Ask for a cup and the man will cut the tops off a pomegranate, put it in the pressers and repeat with more pomegranates until you get a full cup (about 3 or 4). No added sugar, preservatives, colors, etc. Just a glass of lip smacking nature juice in your hands. Mmm mm. My friend Simona, lived in the NE part of Istanbul in Arnavutkoy, close to Bebek and Ortakoy, which is a beautiful part of town right on the Bosphorous. One of the individuals she private tutors for is this free-spirited, awesome guy named Serkan who owns his own seafood restaurant called Takanik Balik. 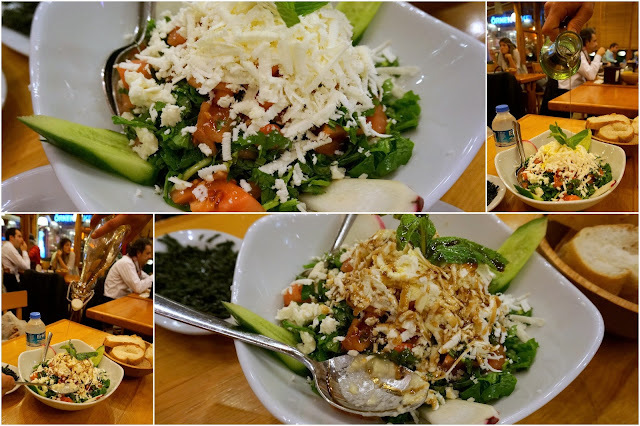 One night, Simona took me to Serkan's busy restaurant for quite the memorable dinner. From the get-go the restaurant was jam-packed with locals who were chattering and eating away. I knew right away this was a real eats place. No pretentiousness, no stuffy air and snobbery going on. Just good, wholesome fresh meals and people filling their hearts and bellies together at the end of another long day. 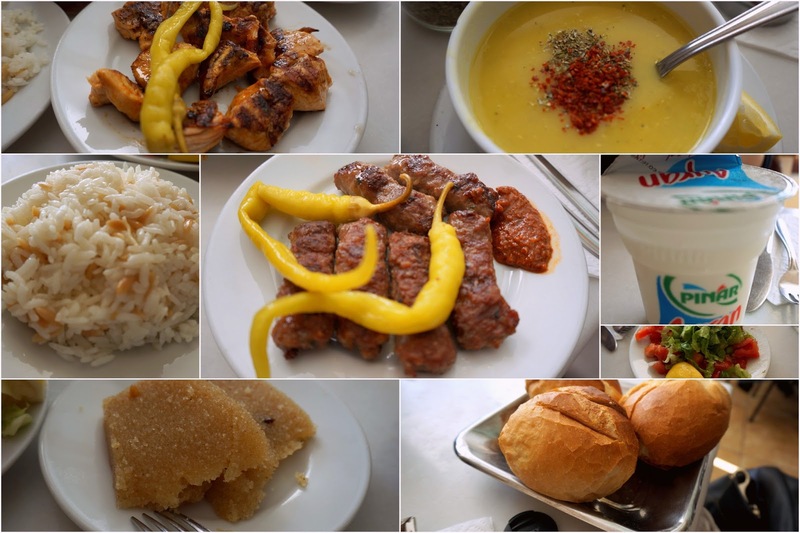 We initially ordered four meze which are small, quick bites one orders with their meals in Turkey. I was quite famished after a long day and when the plates arrived I was already ready to go. 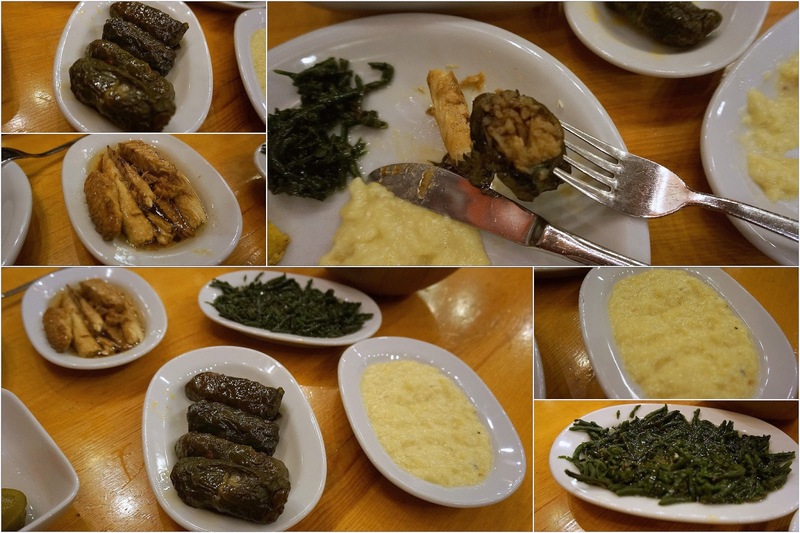 One of our meze was a plate of dolma which are stuffed grape leaves. They're quite common in the region and usually stuffed with meat, seafood, rice and spices. Granted, they may come off a bit off-putting visually for a first-timer but do not hesitate! These are just so good I'm glad they were in small portions otherwise I may have not been able to control myself! Baba ganoush, which is eggplant and tahini made into a dip was good with our bread but a little bit rich for my taste. I knew if I had too much of it I wouldn't have much room for anything else. The mackerel in olive oil was another clear winner for me. I used to hate fish when I was a kid but as I get older, fish like mackerel are quickly becoming big faves of mine. Thick pieces of meaty protein and omega-3s and only accentuated by a bit of coarse sea salt and olive oil...forget chicken breasts, this is real power house food right there! The sea vegetable dish was a unique one I'm not sure the name of. I tried searching online to no luck. The way it was explained to me was that it was a sea plant which, I believe, had been slightly cooked. It reminded me of sea grapes in Japan and tasted fresh from the ocean and I'm sure were full of good nutrients. I must say, I wouldn't recommend the dish for those that are on the impartial side to seafood however as the taste and the ocean smell/taste might be off-putting to some. Our salad, like so many salads in Turkey, was a work of art. Cucumbers and tomatoes sat nestled in a bed of fresh-cut arugula (also known as rocket) while a mound of freshly shaven cheese served as the peak of this salad mountain. As the waiter began to drizzle on the olive oil and balsamic vinegar, I sat marveling at the excellence that was before me. Created by nature and minimally touched by human hands, I shoveled in the salad in between bites of my feast as my smile grew through the meal. Simona had raved to me about the freshly grilled calamari here and naturally, my anticipation was high for the dish. When the dish arrived I could immediately smell the fresh cooked calamari with ever the slight hint of a few spices wafting into my nose. Scoured with charred marks, the chewy calamari was accompanied with a small bowl of balsamic vinegar and olive oil but for me, the dip was unneeded. I had already seen the restaurant hauling in fresh catches from the sea every morning on my morning walks in the neighborhood but now I could taste the freshness. The calamari were grilled to perfection; a moment longer on the grill and they could have become the texture of rubber bands but these were just right. I saw no need for any other dip as the calamari carried within it the salty ocean flavor while the notes of spices enveloped the ocean taste without derailing it. My friend Simona was correct- this was bliss. Our eyes were certainly bigger than our stomach as the two of us gobbled everything up and had no room for the fish stew or other mains that were said to be scrumptious (why did God make us with only one stomach I sometimes sadly wonder). As Simona pointed out though, there was a separate room for dessert and thought I protested while nursing my full belly, she said I simply had to try their sweet potato dish and an order was quickly put in. In general, I've found Turkish desserts similar in style of the main dishes in that they let the ingredients speak for themselves without masking it in heavy sauces and whatnots. The sweet potato dessert was a simple (baked?) sweet potato that had been cooked at its peak ripeness and given a small shower of crushed nuts and a spoon of clotted cream on top. Nothing more, nothing less. It was such a simple but satisfying end to the meal with the dessert being neither too sweet or heavy. Just a small dressed up sweet potato acting as the closing sweet touch to such a fine meal. Close your eyes and imagine the different textures and tastes of this simple dessert mixing together in your mouth and tell me you haven't begun salivating! Turkish-style breakfasts were another big winner for me. American-style breakfasts are hearty but quite rich for me so I usually indulge in it only once every few weeks. Turkish breakfasts, on the other hand, are hearty and filling but light enough you don't feel like you have to be rolled out of the house. 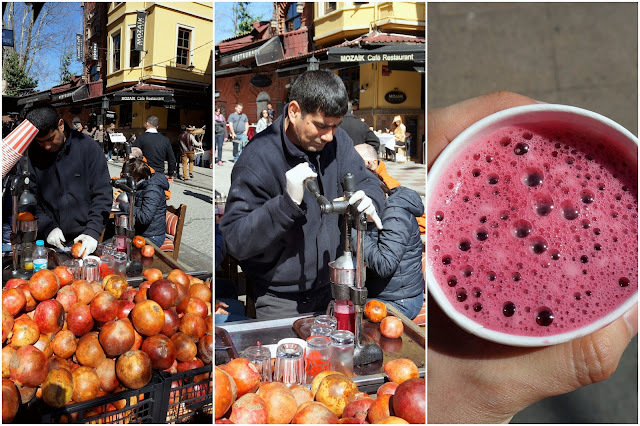 Simona took me to a nice place one morning near Ortakoy and we started it off with some freshly blended juices which incorporated things like carrots, apples, pomegranate, etc. Simona is a pescetarian so she went with this crepe-like dish which was stuffed with cheese and herbs in a thin pancake and accompanied by slices of tomatoes and cucumbers. I was recommended the traditional Turkish breakfast plate and I was not disappointed. You had small sides of jam, honey (with clotted cream) and butter for your obligatory basket of of crusty rolls, a smattering of olives drizzled with olive oil and spices and slices of tomatoes and cucumber on the side. Then you had your various cheeses from salty, soft sheep's milk cheese to milder and harder cow's milk cheeses as well as braided cheese (I believe they're called peyniri with the texture and taste being similar to string cheese). Slices of cold cuts were also included which you could see bits of pistachio inside (how Turkish!). Variations of this breakfast plate were also the staple breakfasts that were served in the various hostels/hotels I stayed in for my travels outside Istanbul and, accompanied by heaping bowlfuls of the lovely yogurts in Turkey and boiled eggs, were really excellent food memories of Turkey. Filling, flavorful and with variety but without feeling like a mess inside afterwards. This was a "western" (as in, non-East Asian) style of breakfast I could easily eat everyday. You got carbs, protein, veggies and fruit all in one meal. What a great way to start a day! Contrary to popular belief, Turkish coffee is less commonly consumed on whole compared to Turkish tea (also known as Cay but pronounced "chai") which is a black tea that is served in tulip-shaped glasses and accompanied by a sugar cube and eaten by the cupful throughout the day. But I also got to try the Turkish coffee for this breakfast meal and was quite intrigued. 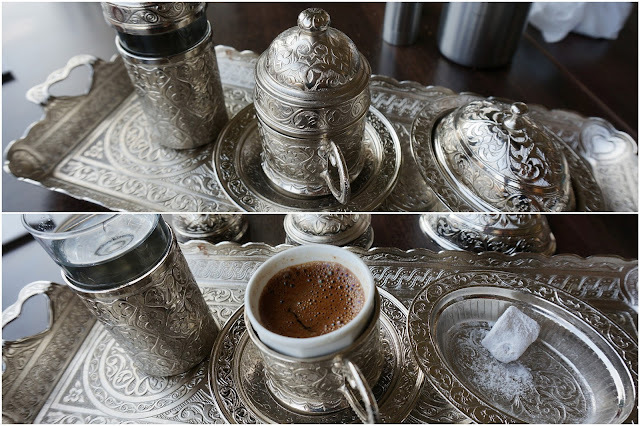 The coffee arrived in ornate holders, dishes and serving plate and was comprised of a small glass of water, a small plate containing a lokum (Turkish delight) and the Turkish coffee itself. Unlike the more commonly known way of preparing coffee, Turkish coffee is prepared by boiling the roasted coffee grounds in the pot itself, sometimes with a little sugar, and letting the grounds settle in the cup. This, as far as I know, is the original way of preparing and drinking coffee as it first began hundreds of years ago in N. Africa and the Middle East. Another nice meal was at Galata, which is a chain of Turkish dishes done slightly more upscale. The branch we visited was in the posh area of Nisantasi which is considered the glitzy shopping area of Turkey. Besides indulging in some more delectable fresh salads (this time a grilled vegetable one and a lentil goat cheese one) I sampled my first pide here, a sort of Turkish pizza dish. Pita is topped with different ingredients such as various cheeses, vegetables and meats and baked. Though I had it in a restaurant, it's a very inexpensive and filling dish that is commonly eaten in local neighborhood eateries. 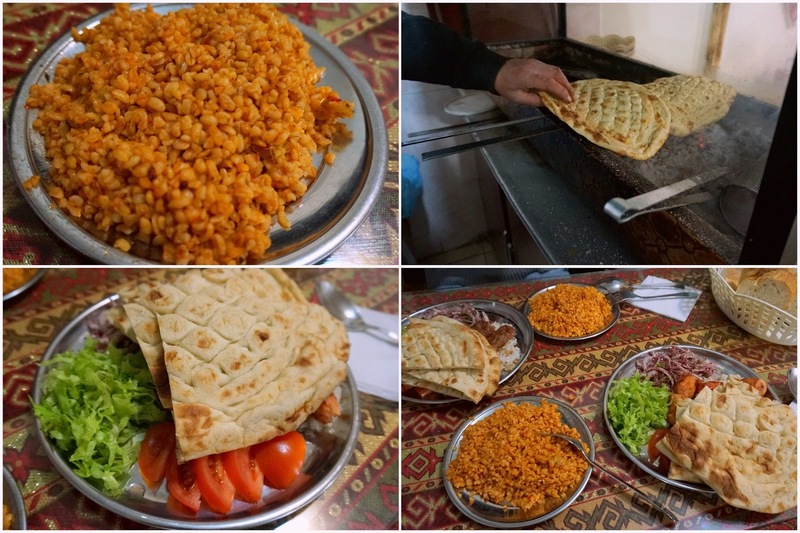 I can't say pides were among the most memorable dishes I had in Turkey but I ate them a few times as a good and cheap eat for lunches during my travel abouts there. 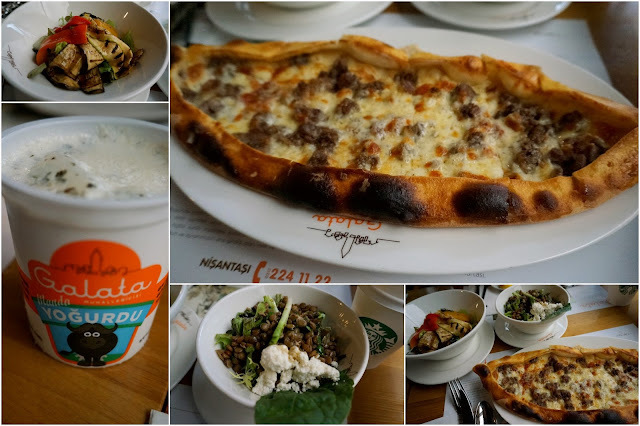 Pide, salad, yogurt. A great lunch I say! Desserts were a specialty of Galata and we settled on two from the extensive desserts list. The first was a sweet potato dish with a layer of cream? yogurt? in between and nuts on top, similar to the one we ate at Takanik Balik. The second was an interesting one called Ashure. The pudding dish is made of grains, fruits and nuts is also known as Noah's Pudding as the dish was said to be originated by Noah's family to celebrate and give thanks after landing on Mount Ararat after the floods. The dessert is almost always made without any animal by-products and are a good dessert dish for vegans. Slightly sweet, slightly creamy and nutty and are just as impressive tasting as it looks and are served for all sorts of occasions. My friend Bing also coincidentally happened to have a short weekend trip in Istanbul during my time in Turkey so we had fun hanging out together and exploring Istanbul on our own for a few days. In his first night in Turkey, Bing arrived quite late in Istanbul and I chose to forego dinner so I could eat with him. After dropping off our stuff in our hotel we went searching late at night for a place to eat on a chilly and rainy Friday night. Most of the eateries were beginning to close up at that hour so we were turned away a few times but we were determined to go where the locals went and finally stumbled upon a small eatery in a random alley in Laleli. Despite the linguistic barriers with the owner, we finally managed to order a few dishes and waited in gleeful anticipation. The grandfatherly man running the place must have sensed the two of us were hungry as he not only gave some filling portions but also gave us grilled pitas to go with our lamb and chicken skewers. Had we known we would be getting the pita (on top of the basket of bread), we probably would have skipped out on ordering the seasoned rice but it was all good. We gorged on the food and caught up with each other's lives while watching the locals pass by on that rainy Friday night. So much food at such low costs!